Thank, Claus! I have been looking for such a solution! In the video, I share the credentials for this file. However, I have just edited the post to include this as well. But have you to tried setting “Maximum number of backups to keep” to 0? If this is set to 0, FileMaker Server won’t add the date and timestamp to the folder name. This eliminates the need of the scripts to rename the folder. Yes, you can set the number of backups to 0, which will eliminate the timestamp on the folder. However, this will prompt FMS to run a full backup instead of an incremental backup. This is very important if you e.g. have a large set of remote containers, that rarely change. So this is the main reason for creating this BackupHelper tool. 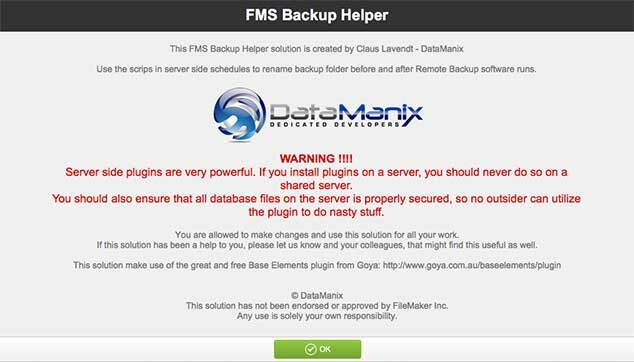 I want BOTH FMS and the remote backup tool to be able to do incremental backup in order to save resources and space. Does that make it more clear ? Yes, very clear. Thanks a lot!